I've pulled fabric for a new Journey Five quilt. I've had it pinned to my design wall for a week and can't seem to decided on which of the two light prints would be best. Both have good qualities and I'm sure would look great. The print on the top is lighter, and has that little dash of red (which, of course, I love), but I'm not sure if I want to go that light. I love the bottom print just as much...it's a bit darker, but will read as more of a solid in the quilt. I can't decide! The decision I did make was to ask you for your help!! Which light print would you choose? 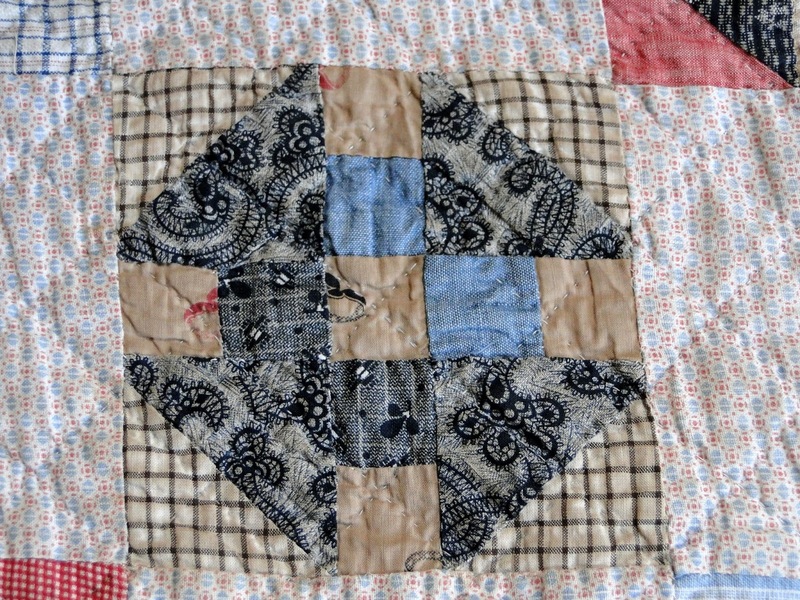 PS....last call to email me a photo of your Orphans & Scraps sew~along quilt! 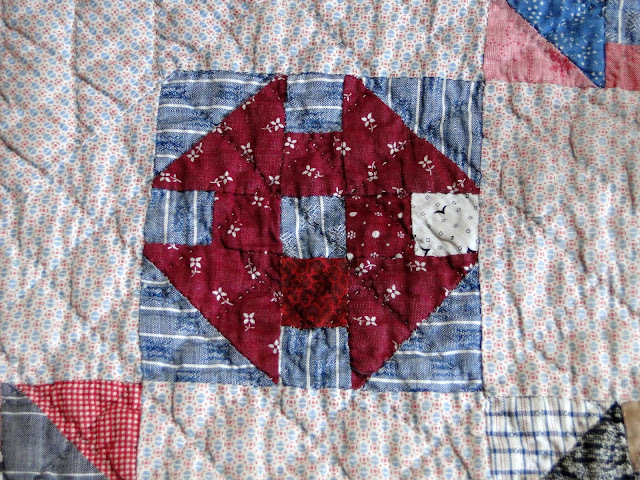 The "Airing of the Quilts" will begin on Monday.....no foolin'! Debbie brought the blocks over to the house so we could arrange them on the design wall, and I took a pictures of some of the blocks and thought I'd share them with you. As you can see, I love pairing the wovens with the cottons, and I think it looks wonderful! The black woven really makes a striking frame for the lighter colors of the dusty pinks and purples. There are eight colors in both collections: red, blue, green, black, brown, gold, pink & purple. I love playing with the color and fabric combinations, and one of my favorites is red, white & blue. The plaid just really adds an interesting pattern and texture. I adore the color black. There was a time I didn't think it belonged anywhere, but black just really makes other colors pop. Now, I have a lot of black in my home...in furniture, tchotkes, picture frames, and oh yes....quilts. Lovin' the fabric combo and the gold woven. Do you like black fabric? The dobby background fabric is absolutely luscious!!! Wait until you feel how soft it is. The simple difference between an ordinary woven and a dobby are the raised threads. The soft stripe and intermittent threads give so much interest to the block, and make look so good with the brown and red plaid. The background plaid for this block is also a dobby. It provides such a soft backdrop for the bolder blue and green prints in the block. Those are just a few of the 42 blocks in the Pins & Needles quilt, but I hope they give you a feel for how the two collections look together. I will have another single pattern, called Abigail's Pins, using both collections, and I'm making several Journey Five projects from them as well. Both collections will be in your local quilt shop in early June, and I've heard that many will be kitting projects, so check with your favorite quilt shop! Time to get back to work.....thanks so much for taking a moment to visit with me! Ta Da! Here's a look at the first quilt for The Prairie Women's Sewing Circle club ~ Journey Five! The name of the quilt is Pleasant Prairie. Had loads of fun making it. 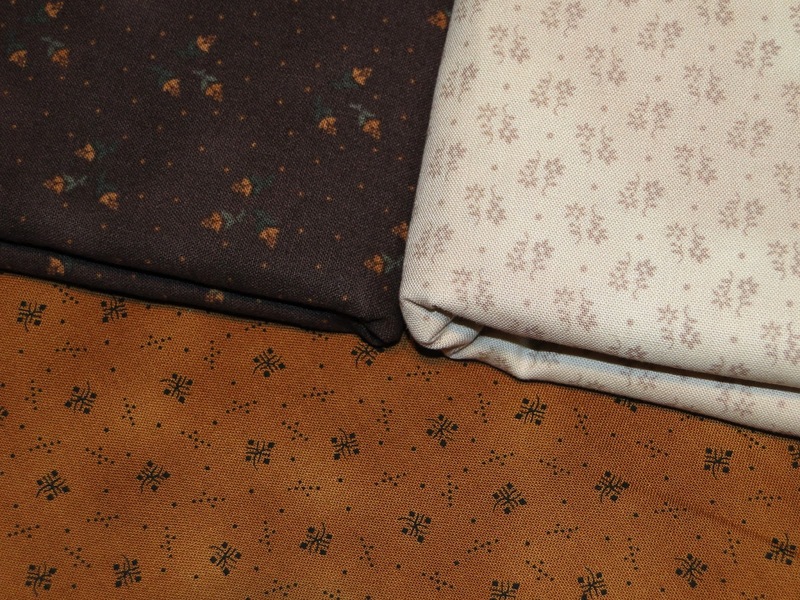 Remember how I covet the border fabric which is an old Jo Morton? I only had a fat quarter of it, which wasn't enough to make the quilt with whole pieces, so I "made-do" with what I had and pieced the side borders together. They turned out fairly well, I think. Next week, I'll start on another.....so stay tuned. Enjoy your weekend and I hope you get some time to sew. As always....thanks a bunch for stopping by! PS....don't forget to email me your Orphans & Scraps photos along with where you live. It's almost time for the "Airing of the Quilts"!! Good To Have Sewin' Time! It's been so wonderful to have some time to sew lately. Here's how things are progressing thus far. I'm loving how the fabrics and colors are playing together, and the block is so cute! I should have this quilt all done for a picture in my next post. Did you notice that I added a new poll to the sidebar of my blog? This time, I'm asking if you'd ever consider attending a retreat in conjunction with a national quilt show? Perhaps take a few wonderful days to sew with some "girlfriends", and then board a bus together to see the show and shop? Sounds like fun, doesn't it? Well, for now, I'm just gathering information, but your comments really will help with some ideas being kicked around. Take a look at the destinations and click on as many as you think sound good to you.....and thank you for your opinion! Unbelievable!! That about sums up my feelings over all of your comments about how long you've been quilting and how you quilt your quilts. You all blew me away!! I thoroughly enjoyed reading each and every comment. I'm amazed and thrilled (and not just a little green with envy) over how many of you still hand quilt! I had no idea!! You've inspired me to give it a try, at least for a small project. And..I will be taking a class to learn the proper techniques!! I have been quilting for 21 years now. The time has gone so fast. I machine quilt all of my own quilts. Years ago I started, and tried to learn to hand quilt, and that quilt is still waiting for me to finish. I enjoy every part of the quilting process from beginning to end. Congratulations, Patti! 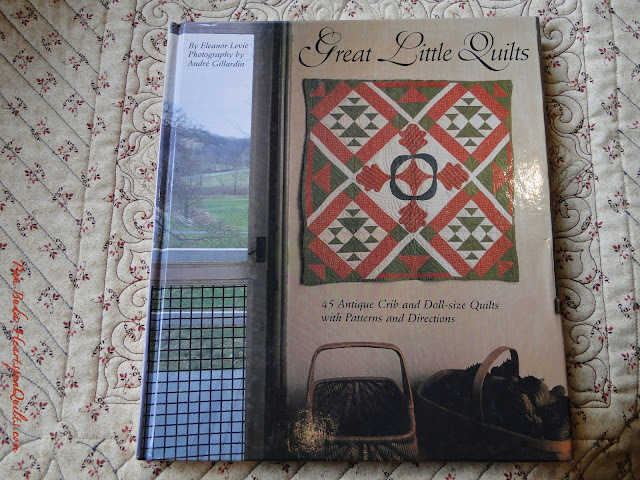 I hope you enjoy the history and quilts is this wonderful book. Thanks to everyone who participated!! My little quilt is well under way and I'm loving how well the fabrics are playing with each other. It feels good to have some time to sew! Gosh...it's the best medicine for stress and SO good for the soul! After a weekend spent preparing stuff for the tax guy and other boring chores, this is just what I needed! I think this little quilt will be finished by tomorrow. As it comes together and I place the parts on the design wall, I'm really loving how it's turning out! That's the "quilting high" we get when we create a new quilt, and as each step is completed, and we see it begin to take shape, and it's turning out just like we hoped....aahhhh!! J O Y! 53% of you have, at some time, mixed wovens and cottons together into a quilt. 7% of you have never done so and don't care for the mix. 39% of you have not, but would like to give it a try. I'm happy to see that the majority of you have mixed the two, and a resounding 39% are willing to give it a try. May I mention I know a couple of good cotton and woven fabric collections I can recommend that will look really great together? (teehee!) Fun stats, and I always enjoy getting your opinions. Thanks for participating! One last thing....we're nearing our last call for you to join Lynne Hagmeier (Kansas Troubles) and me on our next Great Girlfriend Get~Away cruise to New England to enjoy the fall colors this September. I know it seems like a long way off, but the deposits are due in April. So...if you've been thinking about this adventure of good times, don't delay!!! 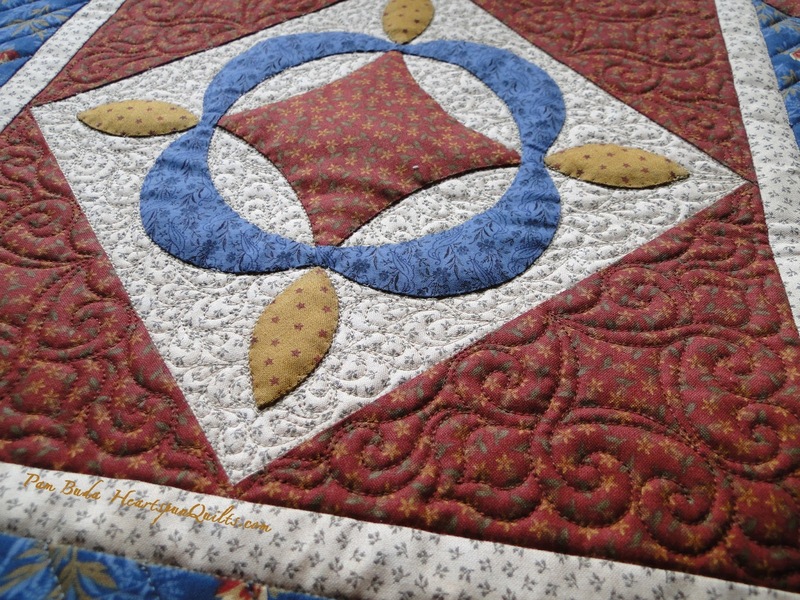 Click here to see all the particulars for this quilting cruise. Celebrate National Quilting Day !! 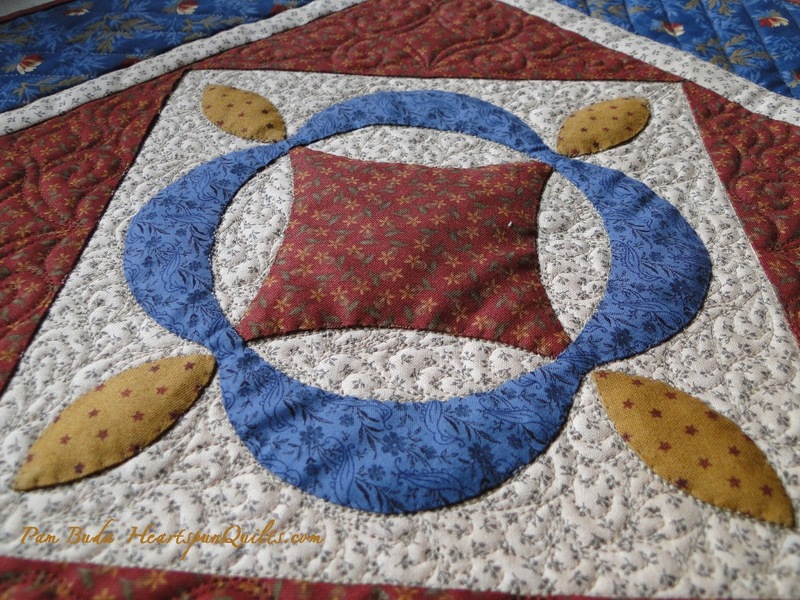 My Spinning Wheel quilt is back, and as usual, my friend and quilter~extraordinaire, Ronda, has added her magic. It's often said that the 'quilting makes the quilt', and I couldn't agree more. I thought I'd share some close-up photos of her work. Together, we brainstorm ideas for the quilting designs. Sometimes, I know what I would like, and other times I defer to Ronda's expertise as we choose designs. For the background surrounding the center reel block, I knew I wanted what I call 'peacock feathers', i.e., ovals inside of ovals. Love that look! Leaving the applique untouched, this tight background fill makes the applique pop. L O V E!! 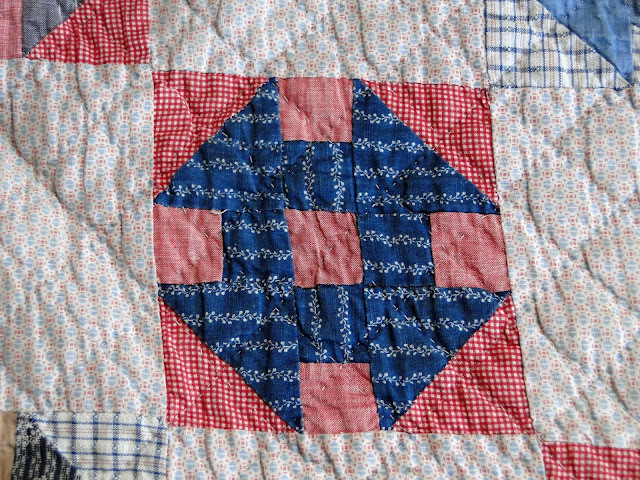 For the setting triangles around the center block, I chose a simple design, noting the "diamond" in the center of the quilt pattern replicated the shape in the middle of the reel. The border decision was the most challenging. I wanted something that would not over-run the beautiful border fabric and I also wanted to avoid stitching over the border appliques. 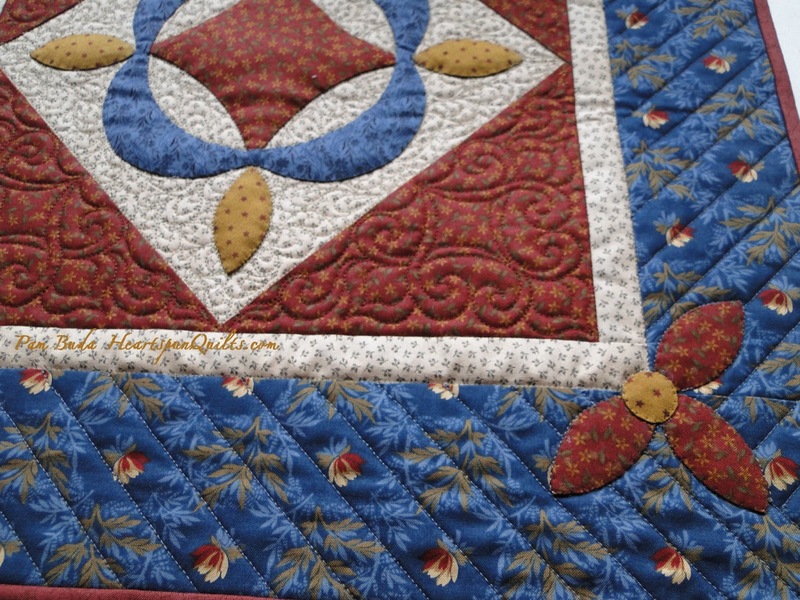 We had a heck of a time finding just the right color thread, and in the end, I decided that simple diagonal lines would off-set the other "swirling quilting" designs, and she would easily be able to quilt around the appliques. For photographic purposes, I must choose thread colors that match the fabrics 95% of the time. That means that all too often, Ronda's beautiful work isn't seen unless you're able to view the actual quilt. So, since I've been showing you pictures of the top, here's my chance to show off the back of the quilt where her stitches really show up. Pretty awesome, isn't it?!! (I can say that....I didn't do it!) Ronda quilts full time for her business, Simple Comforts Quilting, and if you'd like to contact her, you can do so at rondadranter@msn.com. Many years ago, I had the chance to meet Lynette Jensen (Thimbleberries), and hear her talk about her business, and lots of quilting related stories. One of the things she said was that our entire quilting industry, and every modern quilter today, owe much to our long-arm quilters. As much as I love spending time researching and "living" in the nineteenth century, if we had to hand quilt every quilt we made, we just wouldn't be making as many quilts as we do today. I know I wouldn't for sure! Times that by a few million quilters in America, and you can see how their talents effect the entire quilting world, from patterns, to fabric, and all parts in between! Her words really struck me, and so today, on this national day to celebrate quilting, I'd like to take this opportunity to praise and thank all of our long-arm quilters! Where would we be without you? And....what's a celebration without a give-away?? I have an extra copy of one of my favorite books, Great Little Quilts , and it needs a loving home. So, leave me a comment, telling me how long you've been quilting. 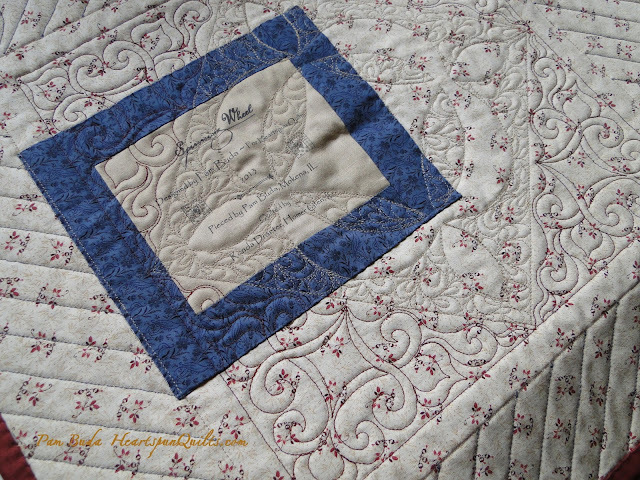 Do you quilt your own quilts, and have you ever used the services of a long-arm quilter? 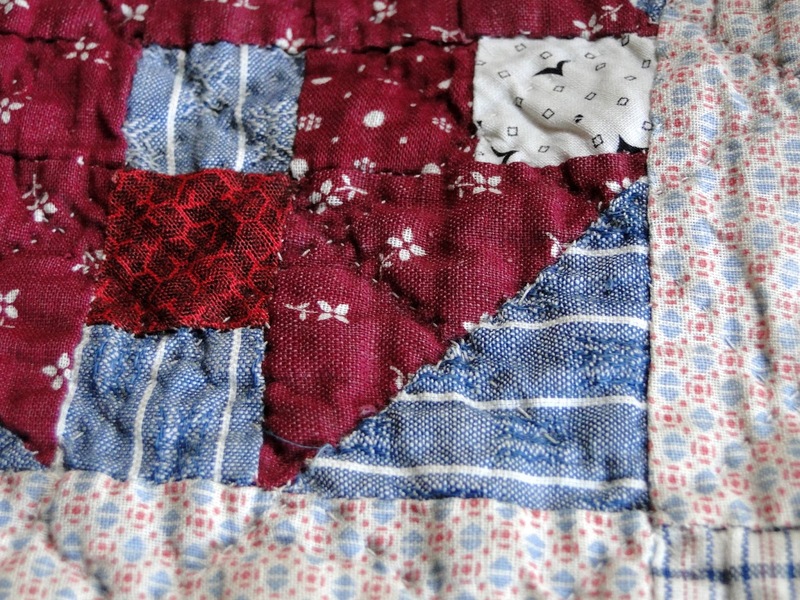 In my humble opinion, hand quilting will always be the ultimate. While I've never learned this art, tell me if you have. Whatever quilting related comment you'd like to share will be fine. Comment by midnight, Monday, March 18th, and the random number thingy will choose a winner, which I'll post on Tuesday morning. Wishing you all heartfelt stitches! 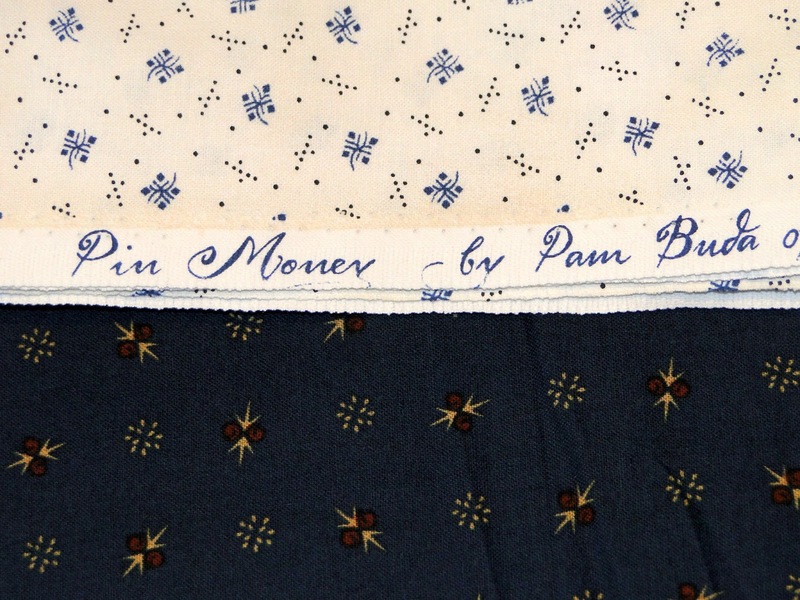 I just adore the name Pin Money. I heard this phrase a couple of years ago, and have never forgotten it, smitten if you will by the story. If you're not familiar with the story or the phrase, allow me to share it with you. The phrase "Pin Money" was coined by first lady, Abigail Adams, wife if president John Adams. As the story goes, while president Adams was making his numerous trips to Europe on state business, Abigail asked him to purchase large quantities of needles and pins for her. She would then sell them to her friends and neighbors for a little extra spending money....her "pin money" as she called it. The phrase took off, so much so, that even many years later, in 1926, when Sherman Edwards wrote the musical 1776, he included the reference to 'pin money" in the song lyrics! From time to time, I still see the phrase in articles here and there, and I think about Abigail, and her industrious way of making a little spending money for herself. Isn't that a sweet story? I thought the phrase was a good fit for this collection. I encourage you to say "Pin Money" when referring to your extra stash of cash....let's renew the phrase! 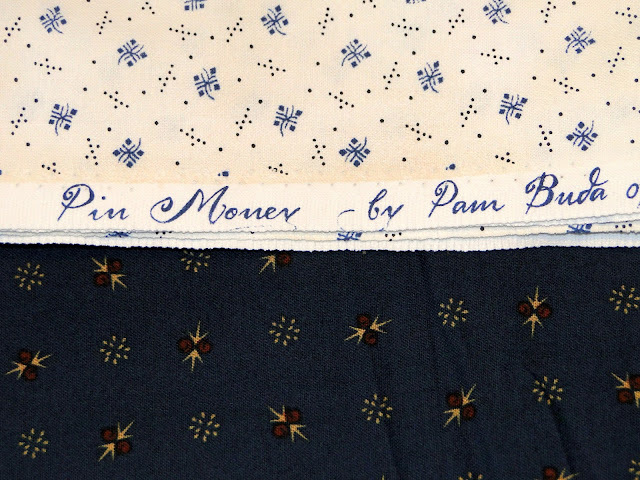 The prints and colors of my Pin Money fabric collection were designed to be a wonderful "basics" line. 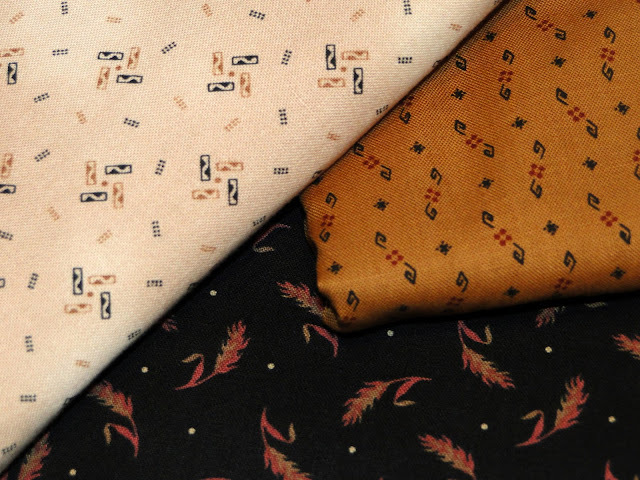 These prints play very well with one another as well as blend with other reproduction fabrics....and, of course, look great with the Prairie Wovens, Dobbies, and Chambray. There are several light print shirtings, and two beige tone-on-tones along with a variety of prints in my eight favorite colors: red, blue, green, plum, black, brown, gold and dusty pink. These are the colors in my "wheel house", if you will. I use these colors to decorate my home, in the fabrics I choose and create, and in the quilts I make. They are olde, vintage colors that have been around hundreds of years. Here's a look at a few photos of the Pin Money prints. I'm not the best photographer (as you know!) and some of the photos of the other colored prints didn't turn out so well (sigh), but you can see the entire collection by clicking on the links above. We've started cutting and sewing the projects I've designed with both collections, and as we're piecing away, I'll be taking photos. We're well into other projects for Journey Five of the Prairie Women's Sewing Circle club, too! Several of you emailed me to ask what the difference is between a woven and a dobbie. Click here to see my post explaining the differences. You also asked for more information about these fabrics. I'm afraid I don't have much information, but what I do know, I'm happy to share with you. If you know more about these collections, please leave a comment! The main multicolored print on the left is Jo Morton but I don't know what collection. 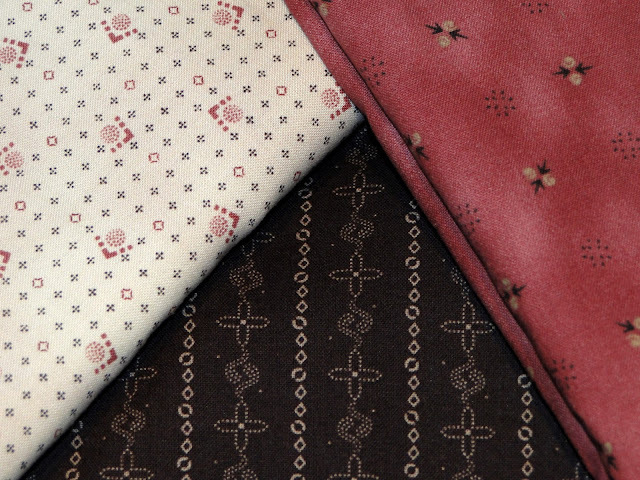 The red and dark brown prints are both from Lecien's Mrs. March collections. I don't have any info on the gold. The lovely berry background print is The General's Wives by Nancy Gere for Windham. In my last post, I talked a bit about combining lovely cotton wovens, dobbies and chambray fabrics in blocks with cotton prints. 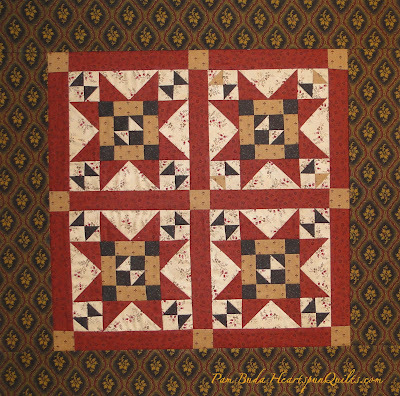 As I have seen this combination so often in my antique quilts, and really love the look, I wanted to create two fabric collections that would work well together to achieve this tradition. 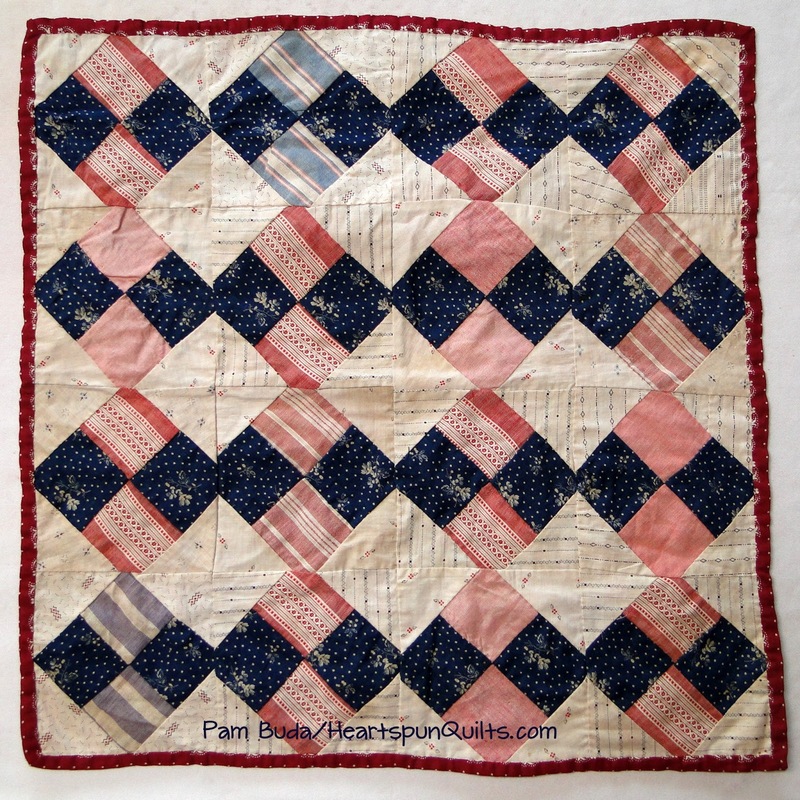 American Patchwork & Quilting magazine. 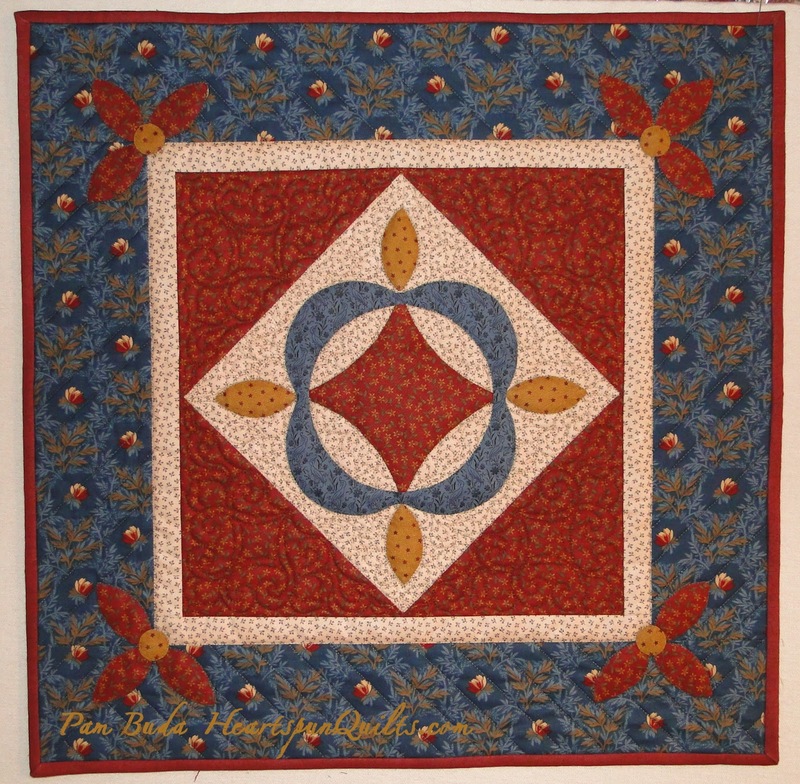 Patchwork & Quilting magazine in 2009. 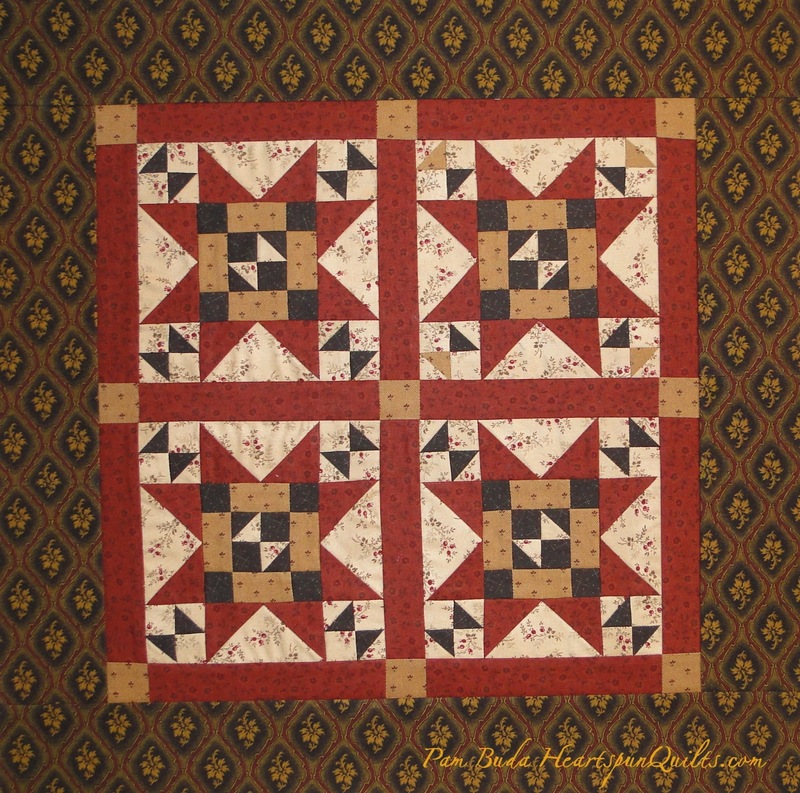 It is a wonderful, sweet quilt, a great example of a "make-do" quilt as well, with approximately 90% of the blocks combining wovens, dobbies & chambray fabrics with cotton prints. Loving the combo of the beige prints, the blue worn chambray, and the plaid woven in the corners. 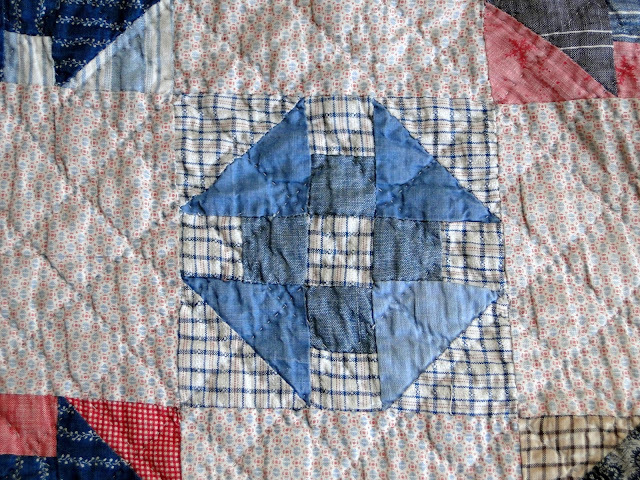 This block has a blue solid cotton, mixed with the chambray, and the dobbie plaid. Loving the shading and textures. The gingham is, of course, a print, as well as the blue print, paired with pink cotton chambray. In this close-up photo, you can see the raised threads of the blue dobbie fabric which I love. I think it really adds interest! I'd love to know what you think! You'll find a poll at the top of the side bar right here on my blog. Answer the question about whether you like to add textured fabrics, never add textured fabrics, or have never tried but are willing to do so! Your vote is completely anonymous! The sweet little pink and blue print you see in the setting squares and borders of this quilt was reproduced in my Heart of the Prairie fabric collection. If you like it as much as I do and want some, please check with your local quilt shop. I also have a few yards left, so if you can't find it at your LQS, email me.....first come, first served until it's gone. Now that all my new sample yardage is here, I can begin making the quilts I have planned for these collections. I'll be sure to post some photos along the way. In case you were wondering, both the Pin Money and Prairie Wovens, Dobbies & Chambray collections should be available in shops June 1st! The purging and re-organizing of my fabric stash goes on......and on......and on. I can't spend all day working on this (and quite frankly, my mind would go numb! ), so for a few hours every day, I whittle away at it. Seems I'm not the only one as my dear friend, Gloria Parsons (Olde Green Cupboard Designs) is doing exactly the same thing! She moved into a new home, so that's why she's going thru her stash, and she said in her last blog post, she's finding fabric from 10 years ago! So nice to know I'm not the only one!! Yesterday, my sorting and purging was interrupted (thank you, FedEx!!) with the delivery of two boxes of sample yardage of my new fabric lines!! That delivery will never get old. First up are the new wovens line called Prairie Wovens, Dobbies & Chambray. When Marcus asked me if I'd like to do a wovens line, I jumped at the chance. I asked if dobbie prints and a chambray could be included and they were delighted to oblige. 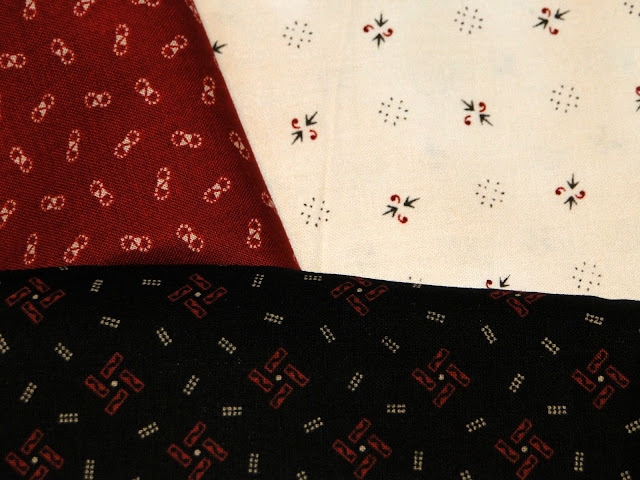 It's very common to see a mix of wovens, dobbies and chambray paired with cottons in antique quilts of the 17th, 18th, and 19th centuries, especially in scrappy quilts, and this gives us all a chance to work them into our reproduction Prairie and Civil War era quilts. Let me show you an example. 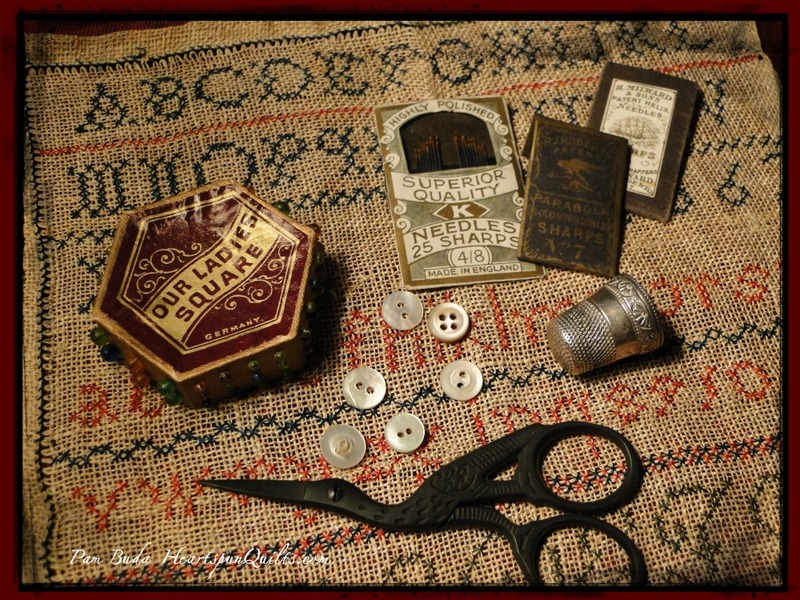 Antique doll quilt and the inspiration for At Mama's Knee pattern in Journey One of the Prairie Women's Sewing Circle club. This is one of my favorite antique quilts. 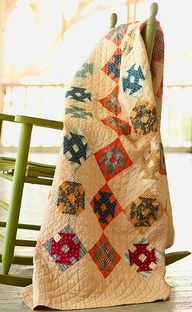 Not only is it just the cutest thing, it's an excellent example of a "Make-Do" quilt. 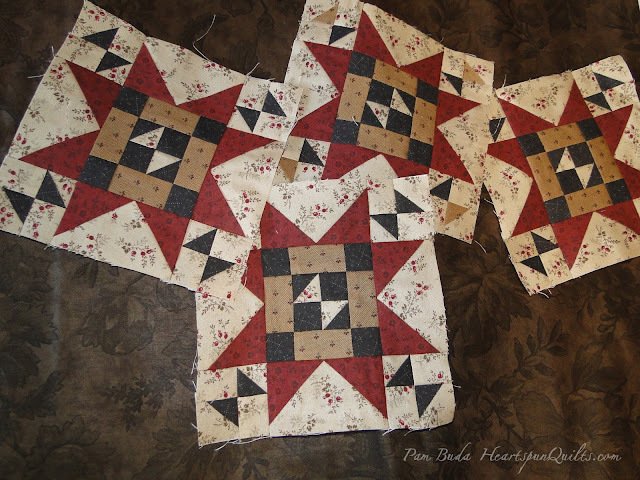 (Click here to read about the difference between a Make-Do and Scrappy quilt.) I believe that a child made this quilt, and it has a make-do backing, too! Notice the blue woven, the pink and white dobbie, and the pink chambray fabrics. The combination of the cotton prints and the textures from the wovens is just luscious and makes the quilt all the more interesting, in mho! Here's a photo of the back showing blue chambray, more wovens and dobbies mixed with cotton prints. Using what she had, she pieced the back, no doubt from scraps of home goods, shirts, and cotton prints perhaps from dresses, aprons, or drapes. Sweet! The palette in this quilt is mostly pastels, of course, but my Prairie Wovens, Dobbies and Chambray are not. They, along with my Pin Money cotton collection are colored in my eight favorite (darker) colors: red, blue, green, plum, brown, black, gold and dusty pink. These are the colors I use all the time. L O V E the pink in there, so long as it's dark and dusty, and not bright. I'll post more examples of cotton prints and wovens pieced together when I share photos of another of my antique quilts. This spectacular make-do quilt was published in American Patchwork & Quilting magazine a few years ago....so stay tuned. May I offer a friendly reminder to email me your Pocket Patchwork Orphans & Scraps quilt photos! You have about 3 weeks to send them to me. Remember, it doesn't have to be quilted or bound. Wait until you see the wide variety of ways quilters from around the world creatively set the blocks!